Mutriku Power Plant during a storm. This grid-connected plant is integrated with an existing breakwater at Mukriku harbour. There are 16 air chambers that are 4.5m wide, 3.1m depth, and 10m high (above Maximum Equinoctial Spring Tide Low Water). A hole of 0.75m diameter leads to a wells turbine and electrical generator of 18.5 kW for each air chamber, yielding the total 296 kW. Located in the Bay of Biscay, Mutriku, Spanish Basque Country. The idea of adding a wave energy generating plant into the breakwater design began in 2002, just as the consenting procedure for the breakwater was on the verge of completion. In 2005, the breakwater was allocated with a design that did not include the wave energy generation. This design was later modified to include the wave energy generation in 2006. The project began construction in March 2009 at a cost of 2 million euros. It officially opened up in July 2011 and has been successfully operating since then. Until June 2018 the plant has supplied to the grid over 1.6GWh of electricity. This facility is now available as a test site providing developers with a unique opportunity to test new concepts in air turbines, generators, control strategies and auxiliary equipment. For the legal processing of this plant, the procedure followed was the standard one for a renewable energy power generation plant. The only particularity in the procedure was the fact that the environmental impact of the plant was analysed by separating the civil works from the electromechanical equipment. The processing of applications to obtain permits started in 2006 and finished in 2009 with the granting of the authorisation for using the public domain of the port. 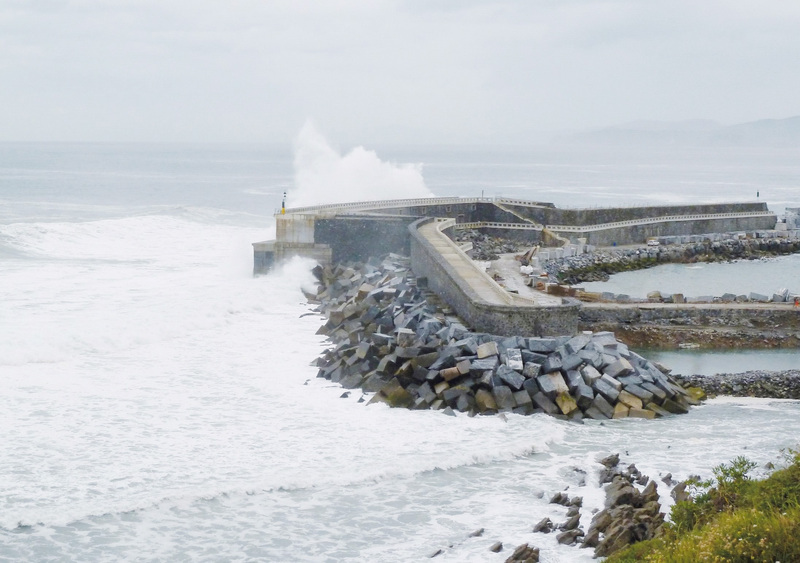 It was not possible to obtain the authorisation for the use of the port public domain before the civil works of the wave plant were completed and the breakwater had been owned by the Port Authority. There may be some environmental concerns regarding the existence of the breakwater and changes in sediment transport and flow dynamics, but the oscillating water columns as an extension of the breakwater does not cause any significant difference. Large amounts of noise were produced during a storm that were reportedly heard 3-10 km away, which concerned the local population and could cause potential harm to the local environment. After the completion of works and during operation of the plant, no complaints have been received to this regard. Like other human activities in the marine environment, some environmental impacts over the marine environment were expected during the Mutriku OWC Plant exploitation phase as well. Among them, the generation of underwater sound during this phase was identified as one of the main expected environmental impact. Mutriku Wave Power Plant is located in Spain. Monitor and reduce the sound levels from the turbines to meet emission standards. A ‘marine’ attenuator was created to reduce the sound outputs. An environmental monitoring program (EMP) was developed by AZTI (www.azti.es) for the monitoring of the underwater sound produced by the Mutriku OWC Plant 2016. This program was funded by the Science, Research and Development Section of the Regional Government (Diputación Foral de Gipuzkoa). Two sampling campaigns were undertaken in 13 sampling stations during summer and winter 2016. In each sampling station a 10 minute sound recording was done and the sound recorded was later processed and analyzed. No evidences of significant acoustic impact coming from the Mutriku OWC Plant were obtained. Nevertheless some important limitations related with the design of the EMP suggested the development in the future of a more advanced monitoring strategy based on the implementation of a permanent acoustic underwater monitoring station cabled to the Mutriku OWC Plant. In May 2018 a fixed hydrophone connected by cable to the OWC Plant has been installed by AZTI (www.azti.es) in order to have continuous monitoring of underwater sound produced by the Mutriku OWC Plant. The installation of this station was funded by the Science, Research and Development Section of the Regional Government (Diputación Foral de Gipuzkoa). Fixed iClisten HF 200 hydrophone of Ocean Sonics cabled to the OWC Plant in order to have continuous monitoring of the underwater sound produced by the Mutriku OWC Plant. This station records 1 minute of underwater sound every 15 minutes, 24/24h. Still in the first stage of operation and managing of the first recorded data. Bald, J., Uriarte, A., Ruiz, P., Cervantes, P. and Ortega, N., 2017. Acoustic characterization of Mutriku OWC Plant. Poster presented in the III Bilbao Marine Energy Week (27-31 March 2017).